Happy Thursday lovelies! 2019 is in full in swing, and to help you make your own wedding day special, we welcome to the blog today Clémentine Ward, from Awardweddings who is going to share with us her top 2019 wedding trends. 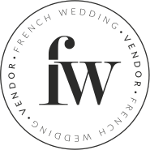 She’ll help you keep your finger on the pulse, giving you the advantage for your upcoming wedding, so let’s now pass you over to Clémentine with her 2019 Wedding Trends. Enjoy! South of France is filled with charming and beautiful places and this is one of the main reasons why so many couples come to celebrate their love here each year. They are constantly searching for unique settings and buildings full of history. Domaine du Beyssac, a 200 year-old abbey, in the South of France is one of them. 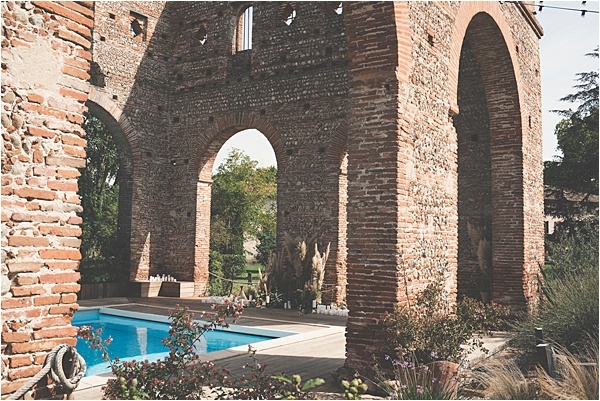 Nested in the countryside, its impressive swimming pool under the abbey’s old bricks arches makes an incredible backdrop for a wedding. 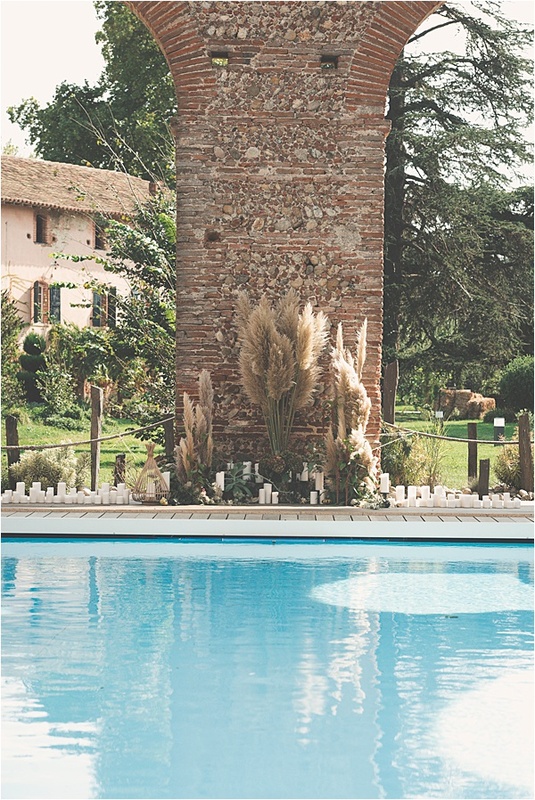 Couples want to immerse themselves in the local environment and culture and they often search for venues that are just stunning by themselves. 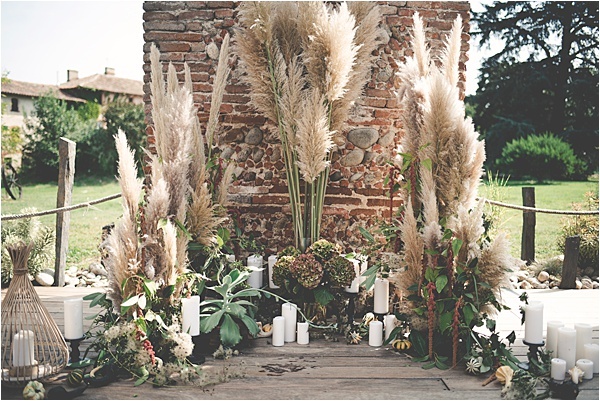 Although we have seen dry flowers for a while, they will be taking more importance in next year’s weddings, and especially pampa grass. We just love their presence and how voluptuous they are! 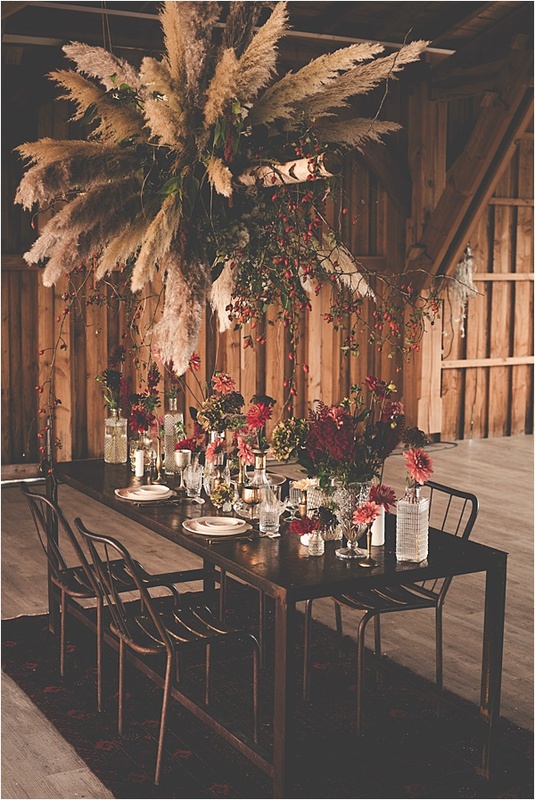 I also love the warmth of natural and red flowers, and given I had chosen a natural venue, I wanted flowers that would subtly enhance its beauty. 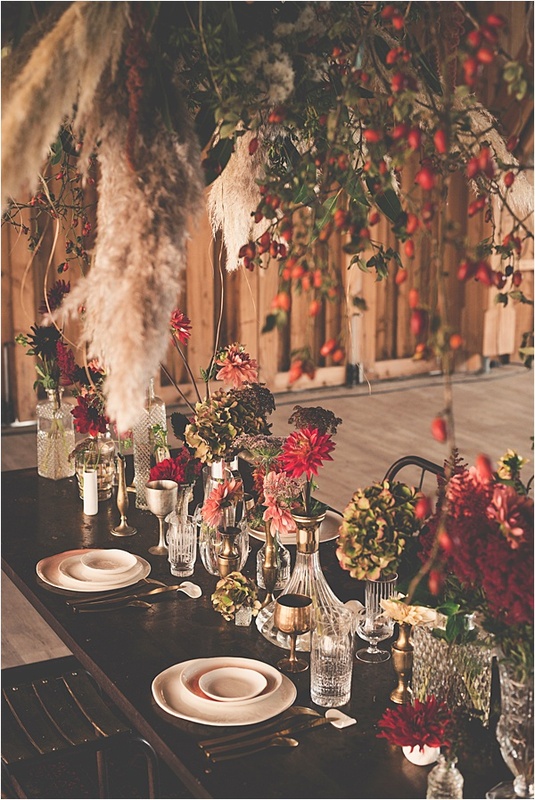 With the florist Les Ideales, we chose natural tones, greens and reds. I like getting away from traditional arrangements and arches to create something a bit more exceptional. 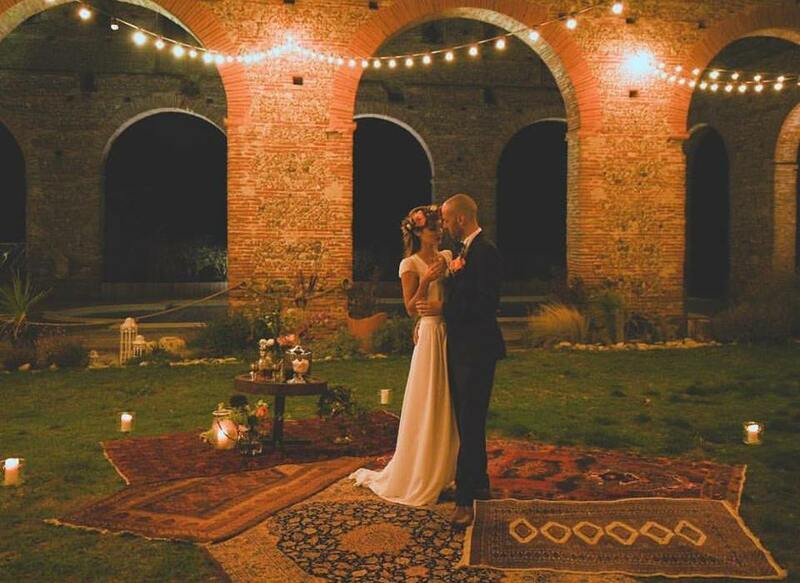 In this shoot, I wanted to create a floor circle arch to wrap the couple so they feel in a haven. 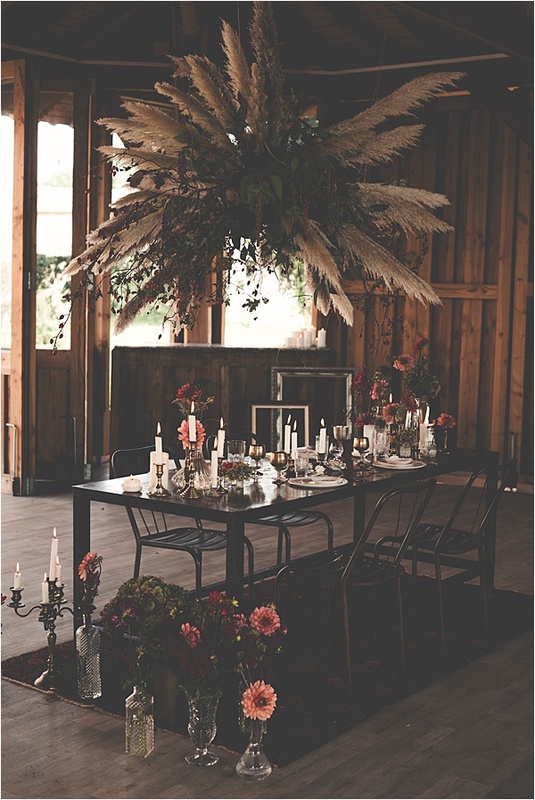 The florist created several arrangements including tall pampa grass vases, mixed with smaller vases of hydrangea and amaranth. She also added a great touch with original shaped vegetables to link in with nature. 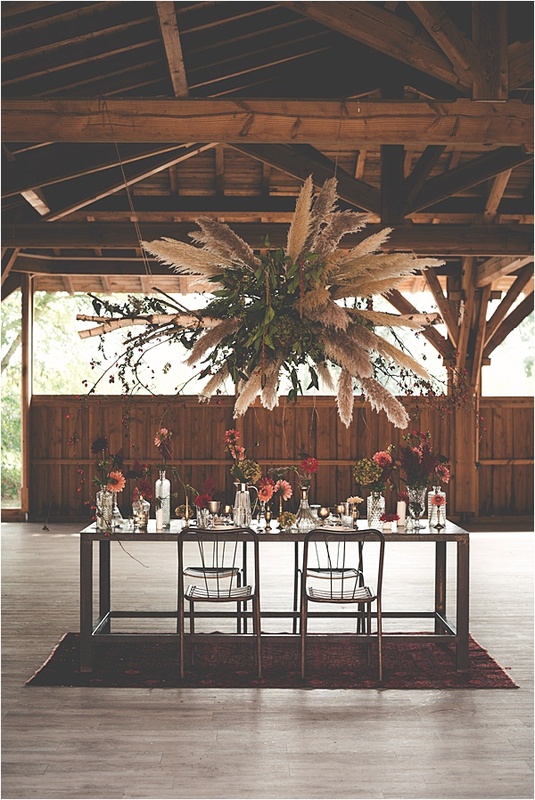 We have seen a rise in impressive floral arrangements, ceiling suspensions, etc… and this will continue. It adds depth to the room and a real wow factor as soon as guests come in the room. 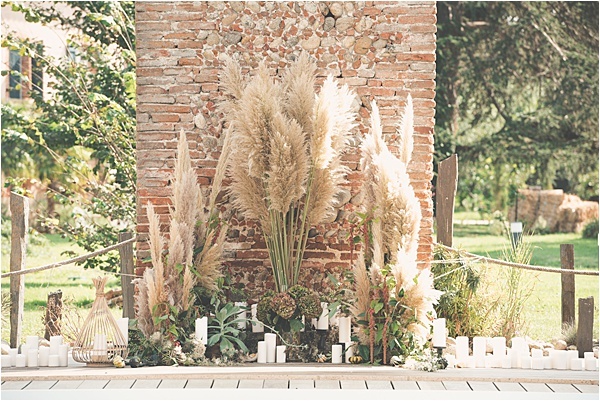 In this shoot, I wanted a structure to link with the ceremony so the florist created one with pampa grass, foliage and a touch of red. There are so many ways to decorate a table and we just couldn’t stop with one, so we created three different styles! The first tablescape shows a mix of multiple flower arrangements displayed on the sides of the table, leaving clear space for candles in the middle and easy face-to-face between guests. 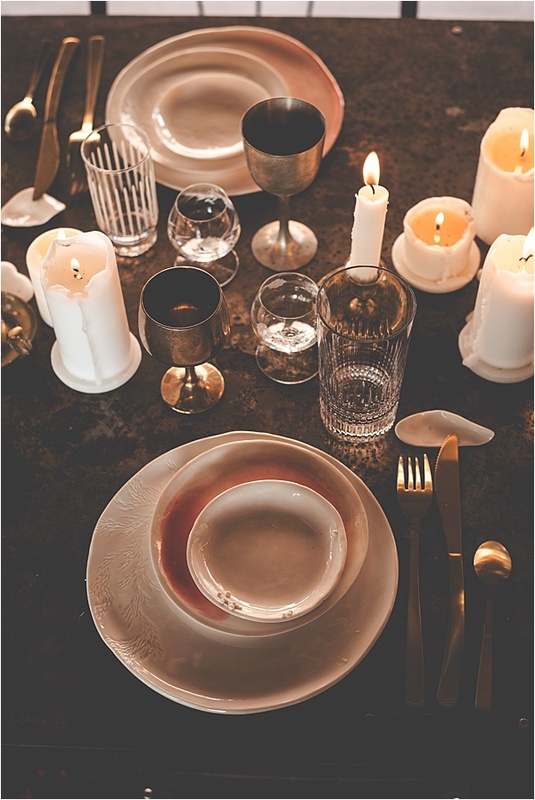 We just love candlelit dinners and created another set-up with candles only. It also fits so perfectly with the metal tables. 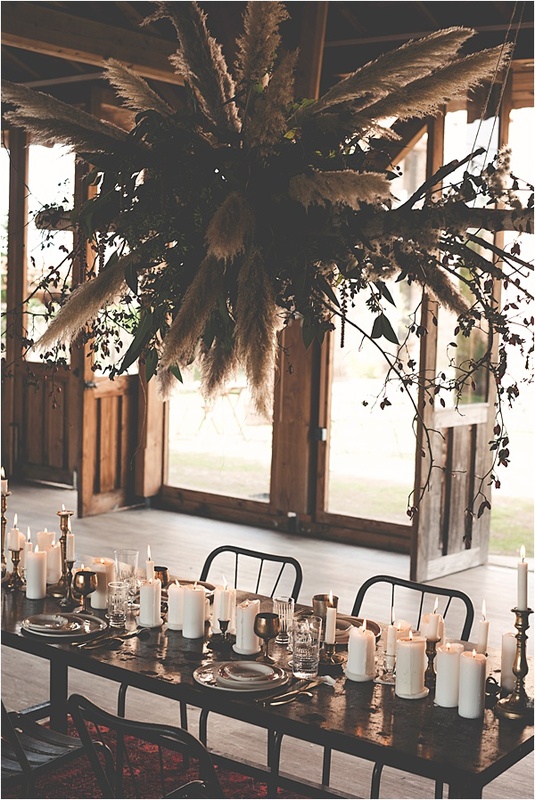 The association of brass/brown metal with cream candles gave a more industrial but oh-so-romantic and very atmospheric effect. 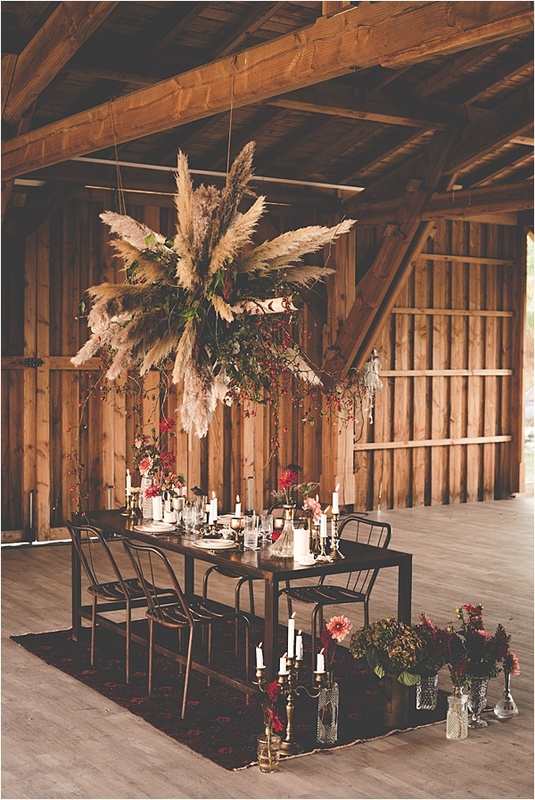 The colors in this set-up concentrate on cream and metals, which brings out the pampa grass in the ceiling suspension. We obviously love flowers so much, and especially these, we created a last tablescape with flowers only, giving an elegant and bright look to the room. 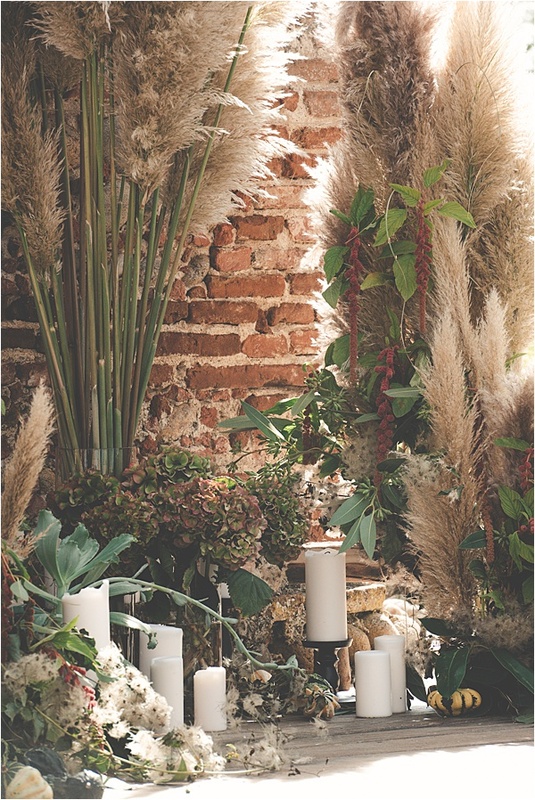 As part of this shoot, I also wanted to mix different materials: the brick from the venue, the flowers (dry and fresh), glass, wood and metal. 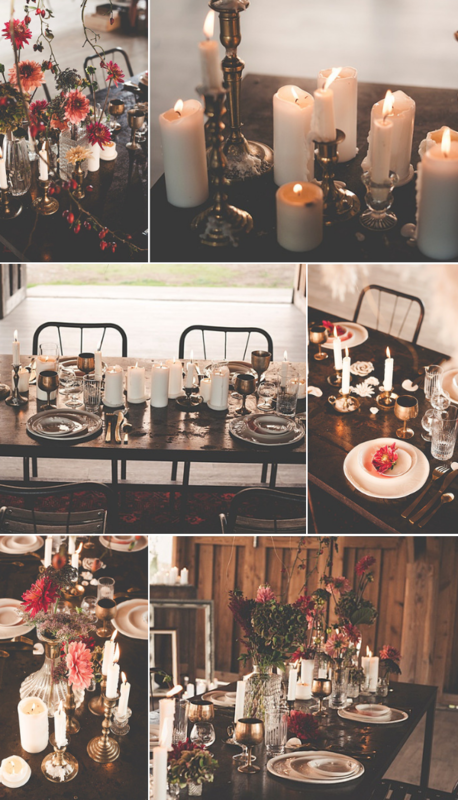 We used this great metal table to complement brass candlesticks, vases, glasses and cutlery. 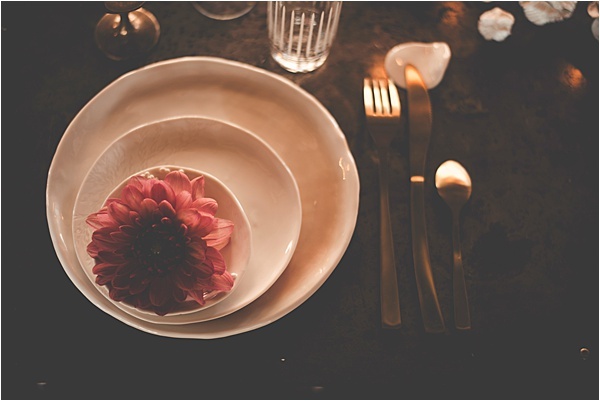 I also sourced this incredible ceramic artist who creates these gorgeous plates and table decorations. 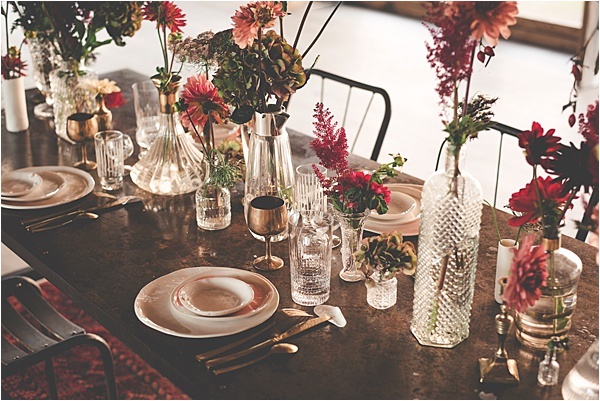 She embellished the table with her absolutely beautiful handmade plates, vases and decorations. These porcelain flowers are a meaningful favor for your guests to bring home and remember your amazing day. We also used dahlias flower heads as plate decorations for the guests to add a color link with the flowers on the side. And finally we finished the room with a beautiful Persian rug underneath the table, to create a warmer atmosphere, just like being at home. 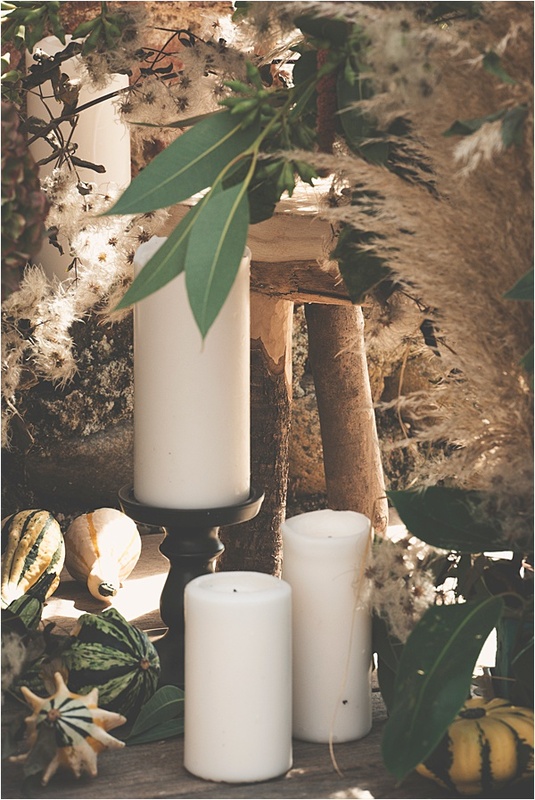 We are delighted to share this natural, elegant, warm shoot as inspiration for 2019 and beyond! Everything is in the detail and each piece is uniquely sourced or created. 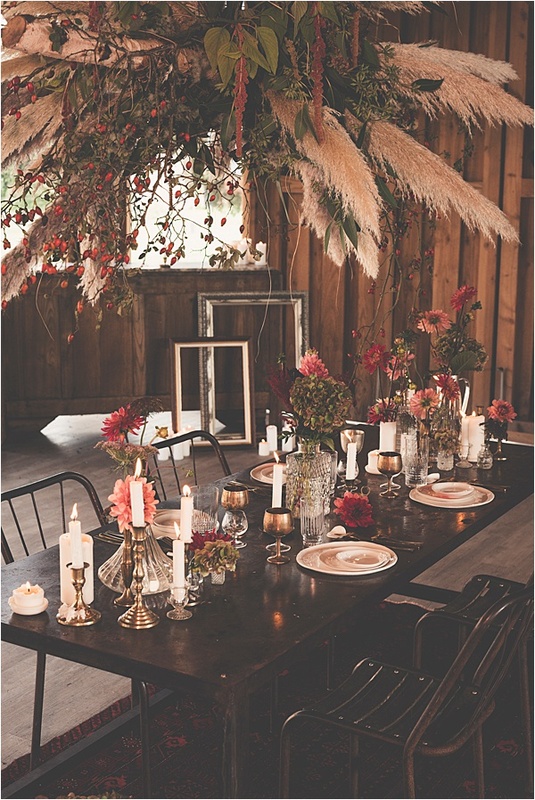 Head over to Awardweddings’ website for more inspiration!